Detroit Autorama’s a GREAT show! So here’s a few of my favorites, then the rest will be in the MyRideisMe picture gallery. 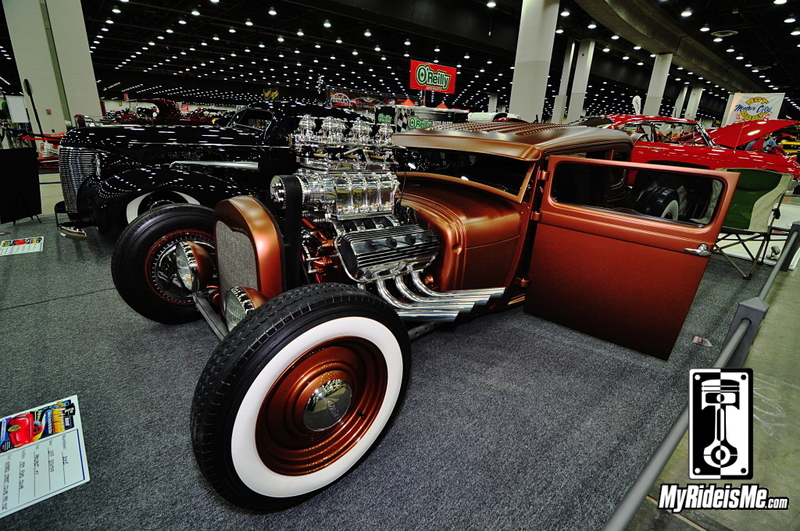 There’s over 200 events covered since 2007, so lots to see in addition to the 2014 Detroit Autorama Coverage! 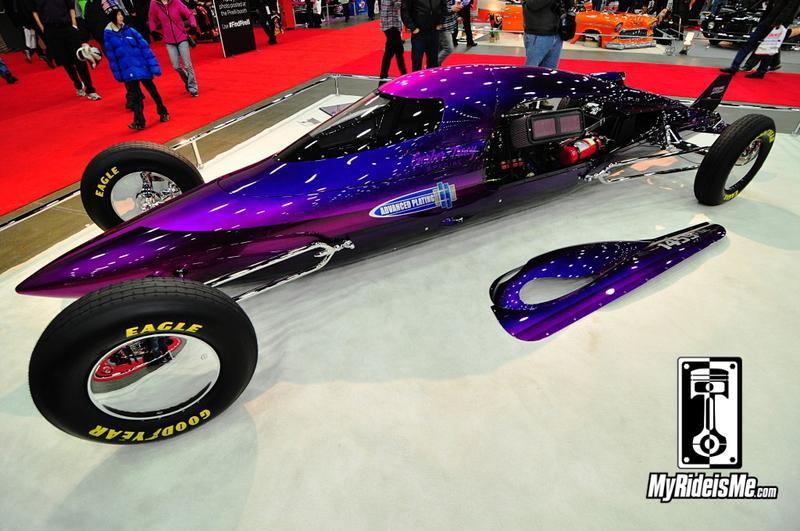 115 of the BEST pictures from Upstairs at Detroit Autorama here. 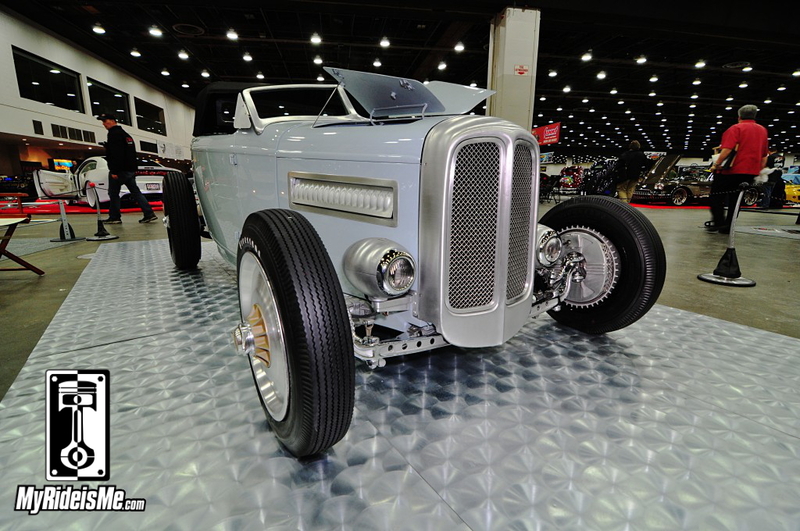 CraftyB 1932 Ford Roadster “Ridled” with details! For 2013, I did a story about “Shoulda-been Great 8” cars. Well, this isn’t a Ridler car, but DAMN! It’s way cool! I met Crafty-B and got to chat just a bit about this car. It oozes details I’ve never seen before. That’s why it’ll be it’s own feature story very soon. 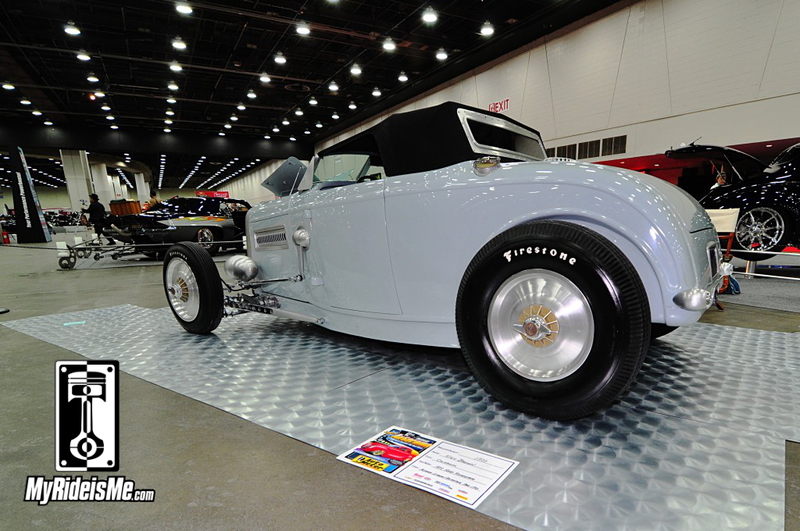 This is one of the coolest 1932 Roadsters I’ve ever seen, hands down. You may be asking what Jeff and Donna Schimpf’s suede painted hot rod model A’s doing upstairs? I don’t know! Fact: What’s the difference!? Loved the color, loved the stance and the 6″ tapering to a whopping 7″ chop up front on slick little coupe. Oh… it’s got a pretty decent looking engine too. 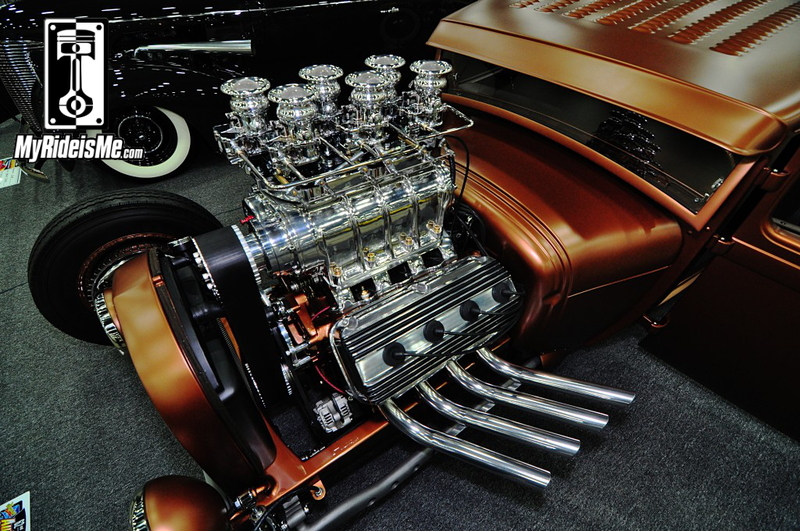 Doubt it runs hard with all those polished Stromberg 97’s and huffer… Zoomies on a Hemi hot rod shifted via a third pedal will always make my favorite list! I better ask Steve and Josh over at Advanced Plating…. does chrome ever rust? 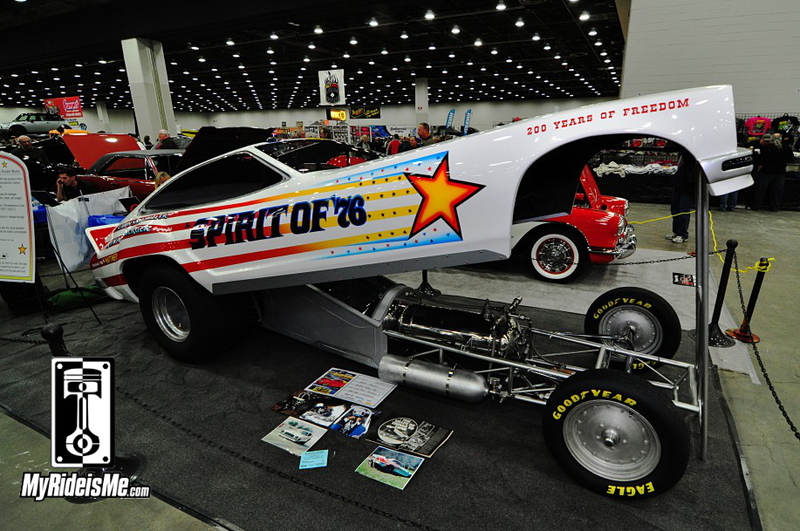 This Bonneville bound lakester made an incredible statement mixed in with the super-show cars and even a few extremely detailed race cars in Cobo Hall. The vintage four-banger (F/GL class) lakester looked flawless thanks to a beautiful purple paint job and copious choromious courtesy of Advanced Plating. Can’t wait to see this race car on the salt at Speed Week 2014! Jegs brought out this slick and race-ready looking vintage Barracuda funny car. I love how it’s not super-restored. No need for it… leave a few cracks in the paint… doesn’t that show the history? The injected 426 Hemi think it’s fine just how it is! Then, here’s a 1976 Mustange II funny car. Not what you’d think of as “nostaglia” funny car or even that cool of a car to begin with, usually… but, this funny’s a rocket car… powered by hydrogen peroxide. You can either clean up a boo-boo with peroxide, or… be the first funny car to do the following: Run a 4 second and 5 second 1/4 mile pass… and be first to 250 mph and 300 mph. Impressive! 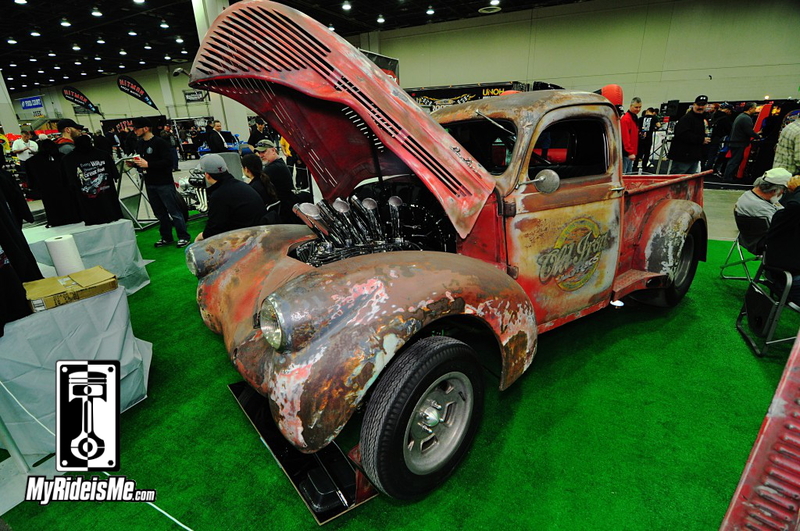 Yea… then there’s this Willys!! 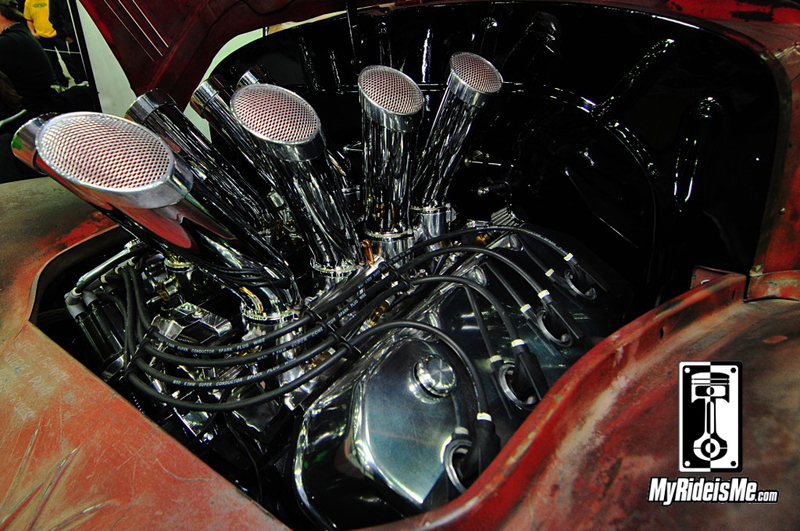 The crazy-curved injector stacks drew me to this Willys to get what looks like a “fisheye” picture, but this is how the stacks are! That’s a 528 cubic inch injected Hemi pushing out ridiculous power via a 727 Torque Flight trans. Luckily a Strange axle and slicks wait out back for all that power. This may be the car I’d most like to go for a ride in at the show. Wrapping up the faves is this pair. 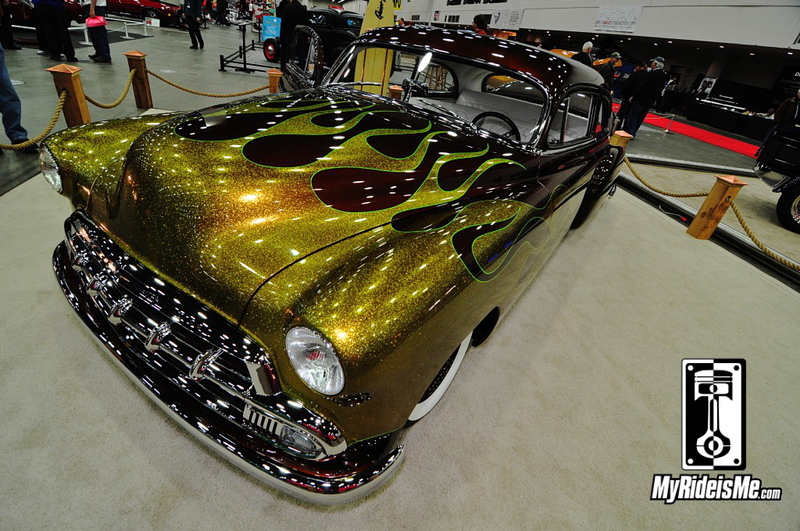 The metal flake and flames make the Chevy and easy choice. The Continental I picked based on length! Look at it! Laid out on Dayton wires with a stout 460 under the hood, Baker College put together a winner. If this fits into your garage, you’re a lucky man! Here’s a few of the “Best of” rides from upstairs. What do you think? 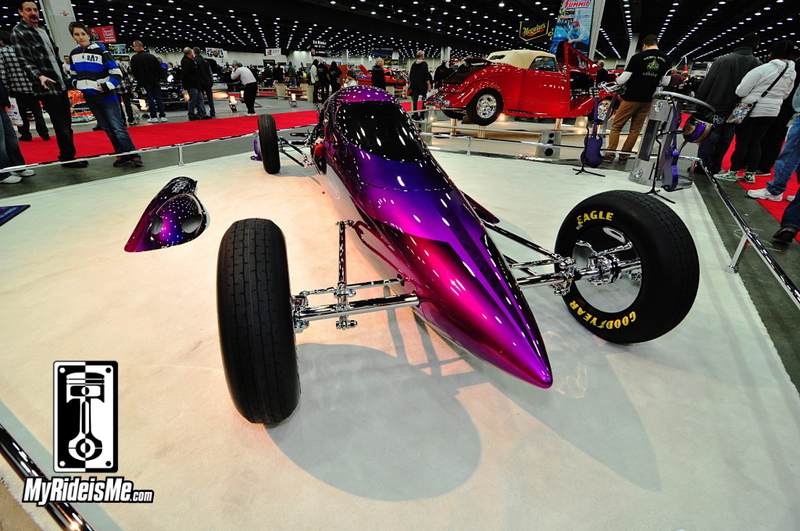 To see all the pictures and the rest of MyRideisMe.com’s pictures from 2014 Detroit Autorama, look right here: Best of 2014 Detroit Autorama Upstairs. If I shot a picture of your car, let us know!